Sydney Rescue Consultants can provide on-site confined space entry management and audit services. If you have a project with multiple confined spaces we can supply an on-site supervisor to help maintain compliance and ensure all workers involved in the confined space works (including entrants, standby, permit holder and rescue team) are doing the right thing and following procedures. We can also provide on-site guidance while the job is on, so work can flow continuously without delay. We will make recommendations based on the hazards and risks of the job to determine if your work area is a confined space. 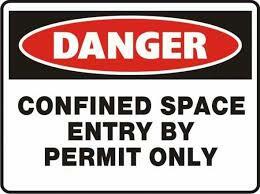 We can complete a confined space register for all known confined spaces at your workplace and supply signage at an additional cost. Note: This is for one TECHNICIAN onsite. Hourly rate: $125 plus GST per hour (minimum 4 hours) additional hours at $125p/h. If the job requires extra technicians or equipment this will also be as per quote.